Enter the 15 in 1 flash card reader. Today, we’re looking at two versions of the device, one from Belkin, and the other from Kensington. They both promise to be the trusty combo wrench of flash cards- and with the piles of cards and wires around, I could definitely use it. Let’s see how each accomplishes its mission. 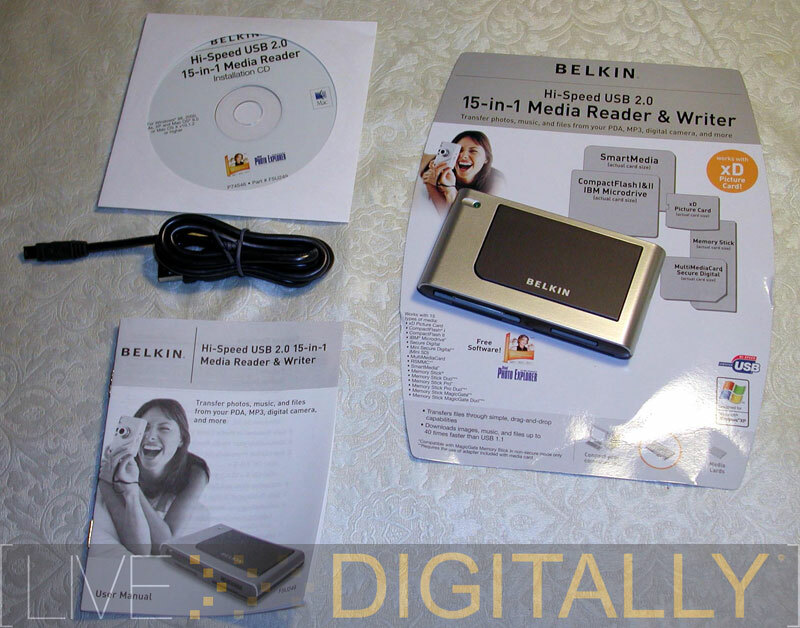 First we look at Belkin’s 15-in-1 Media Reader & Writer. I’ve heard of multiformat writers before, but this device is truly the combination wrench of flash cards. Belkin makes my single media card type (CF) reader rather obsolete in an oh so 90’s kind of way. 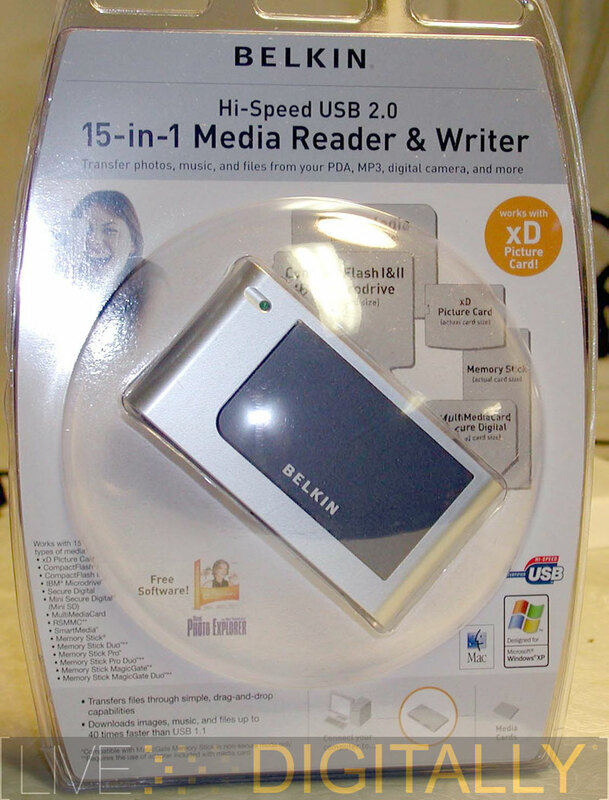 The Belkin 15-in-1 can read and write just about every media card on the market today. It is also a USB 2.0 device, which is an advantage. While internal flash card readers are manufactured, in my opinion, it is a waste to use a precious drive bay for a peripheral that functions so well using USB. Also, we can use the Belkin 15-in-1 Writer across multiple computers with the plug and play ease that USB provides. The Belkin 15-in-1 Reader & Writer does handle an impressive list of card types, in fact, EVERY type I found while researching my flash card article earlier this year. Unlike some other multiformat readers, this one appears as four separate drives when connected to the USB port, instead of just one. 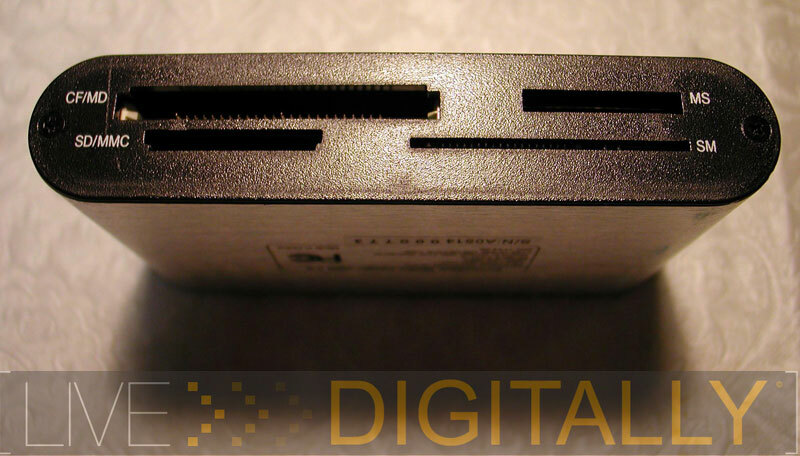 A USB 2.0 port is needed to take advantage of the faster speeds, but was compatible with older USB 1.1 ports as well in testing. Even with no software driver installed, the reader appears as four drives via the Window’s USB storage class driver which is useful if using a buddy’s computer (as in “Yeah, you can use my computer for a few minutes if you have to, but definitely don’t install any software and junk it up”). 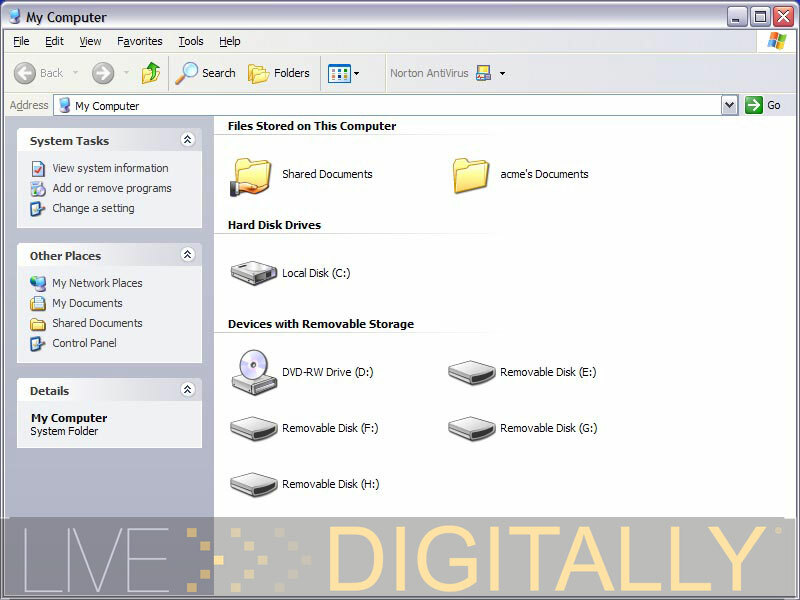 With the driver installed each of the four drives gets a distinct icon and label as to the type of card it can handle. The advantage of this setup is that you can transfer data from one card to another directly as long as they fit into different slots on the unit. The included cord has a generous 43” length unlike many devices sold today. Even users with only rear accessible USB ports on a desktop will have nothing to complain about. Also, the Belkin Media Writer is built with a green LED on top that flashes when reading or writing. This alerts the user to not remove the card during the process if they don’t wish to corrupt their data (or in rare cases, the card itself). 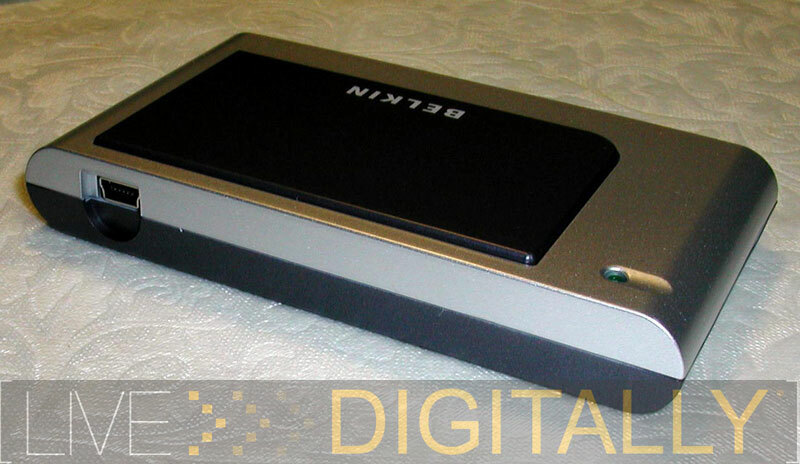 The Belkin 15-in-1 had no difficulty reading and writing to the following cards during testing: Compact Flash, Secure Digital, and MultiMedia Cards. One quirk, is that the SD/MMC slot requires that the card be inserted upside down to be accessed. Each of the cards fit easily, and securely into the appropriate slot. Unfortunately, the slots are not labeled, but it’s pretty easy to figure this out. The performance was identical regardless if the software was installed or not. The included software program is Ulead’s DVD PictureShow 2 SE Basic. It is a simplified version of Ulead’s DVD PictureShow. The program is designed to enable you to make a VideoCD that will play a slideshow. The slideshow can be up to 36 photos, and include music and video clips. Some set top DVD players support this format, and it’s a neat way to send pictures to a loved one. It would be better if the program wrote to DVD discs, but as a thrown in freebie, it’s a decent program. I’ve been playing with, the old adage could be modified to “You can never be too rich, too thin, have too much money, or have too many USB ports.” The Kensington unit adds 3 USB 2.0 ports to your setup, and they are definitely put to good use around my desktop. While the above list is impressive, two things should be noted. First, it is not specified if an adaptor is needed for the smaller card types such as Mini Secure Digital and Memory Stick Duo. As the slots look similar to the Belkin unit, I would assume you do (I don’t own any mini cards to test my hypothesis- yet). 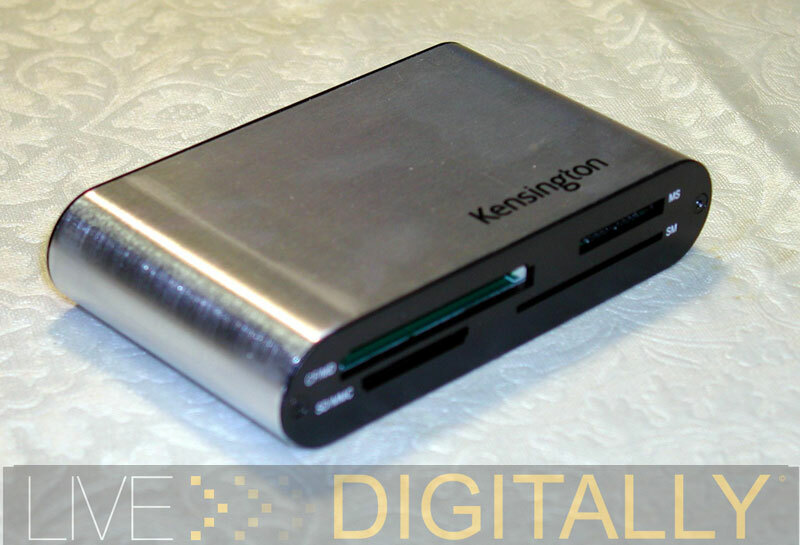 The second issue is that the Kensington unit is not compatible with xD Picture Card media; if you own a Fuji or Olympus digital camera you’re out of luck. The Kensington unit installed easily. It is a plug and play USB device, and the unit appears as 4 separate drives in “My Computer,” allowing direct card to card transfers between slots. Kensington designed this to be powered, so there are two separate wires: one for the USB, and the other for the AC power. On the back of the unit is a red LED that indicates power, there isn’t any LED indication of card activity. The USB ports are on the back of the unit, so you have to spin it around to access the ports. Unfortunately, the 2 wires come out opposite sides of the unit, it would more streamlined if they came out of the same side and could be zip tied together as they worked their way back to behind the computer and the spaghetti of wires underneath my desk. The wires are long enough that the Kensington unit could sit on a desk, with the computer on the floor. 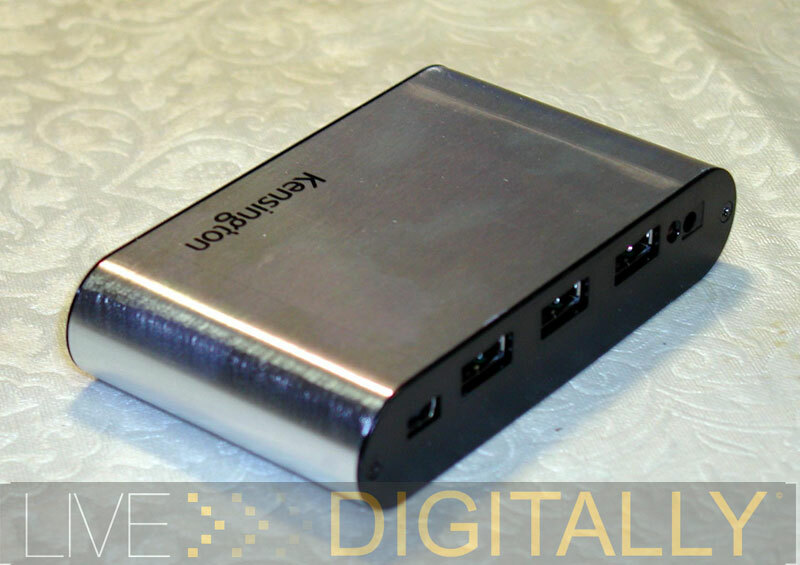 This is ideal for “temporary” USB devices, such as MP3 players, or USB flash drives and how I would intend to use this. It’s great to have the USB ports on my desk with the computer out of the way on the floor, and no need to bend down to access the ports on the computer. For some reason, Kensington is marketing this as a portable device, and includes a travel bag to fit the Pocket Media Center, and the 2 wires. In my opinion, this is superfluous, as I doubt most folks will be moving this around. 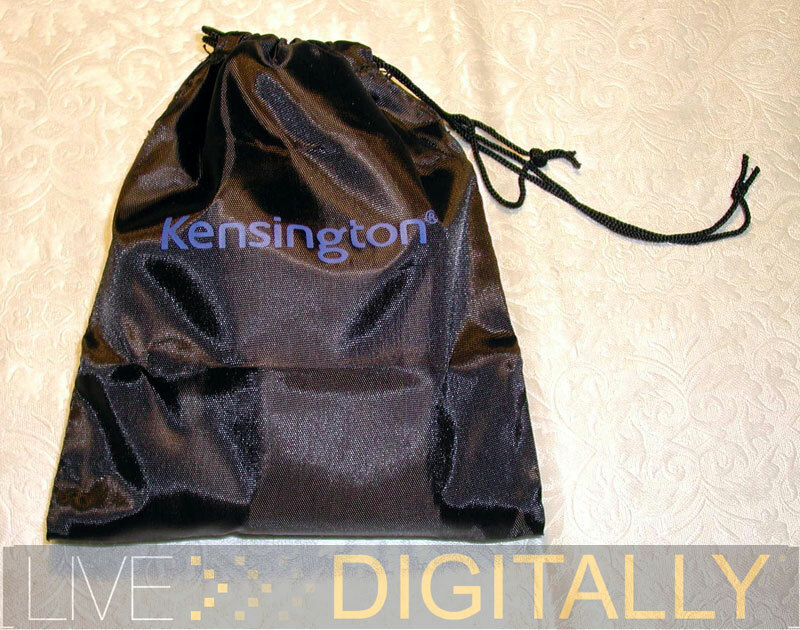 I will say that the Kensington travel bag was well done as it includes their logo, and has a divider in the bag to keep the stainless steel Media Center from getting scratched by the metal ends on the two cords. Of course, in the spirit of pushing hardware to the max, I wondered which of the devices was the fastest at reading their cards. For this test I used a Secure Digital 128 MB card from SanDisk for the flash card test media. 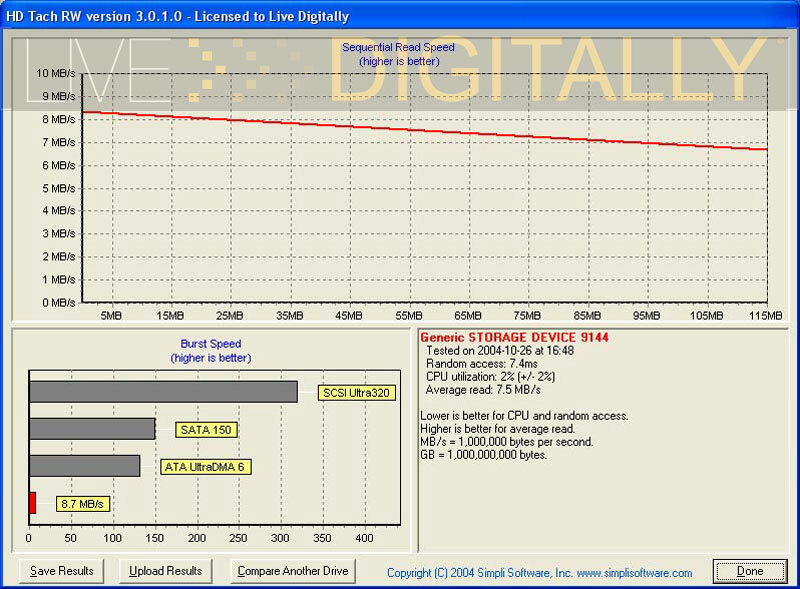 This read speeds were measured using HD Tach 3.0.1.0 available from Simpli Software. When the testing was done, the answer was clear. 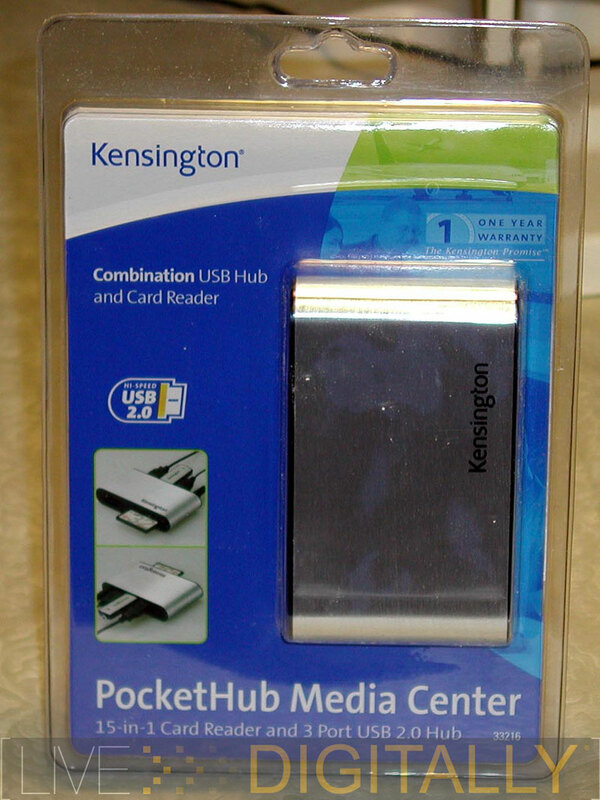 With its separate AC power, the Kensington Pocket Media Center was a notch faster at reading tasks. 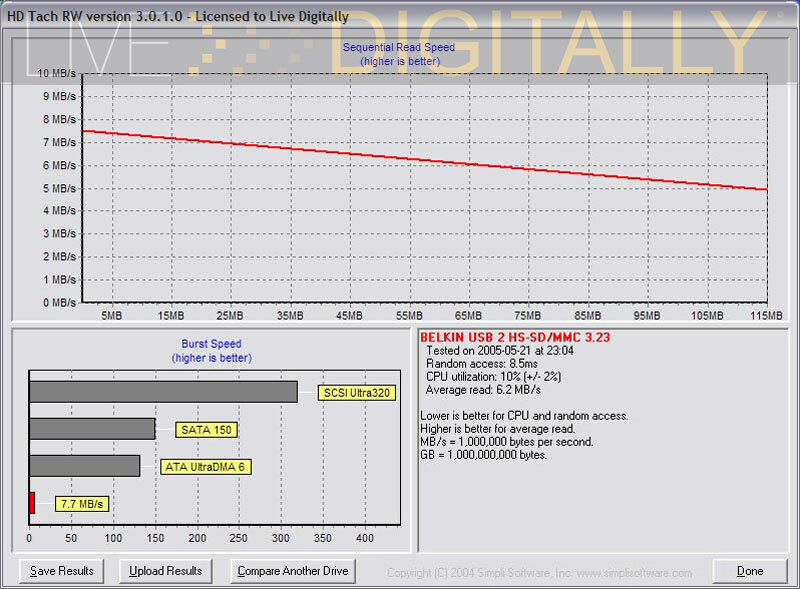 The Kensington averaged 7.5 MB/s, besting the Belkin’s 6.2 MB/s average reading score. This works out to 21% faster and is useful to know if you are planning to read several gig’s of flash cards on a daily basis. The burst speeds were similarly separated as well. The graphics pro who needs to read every card on the market with ease would be a perfect candidate for such a device. No need to turn away a client for not being able to read their flash card. The photographer on the go, owning several different brands of cameras using different cards, and needing access to their photos in the field without toting a crate of wires, extra cards and adaptors should reserve a spot in their notebook case for this peripheral. Not only will it make it easier to grab the pics off of each family member’s camera, but it will save money on batteries as well by allowing the cameras to stay off during imports. This is where I envision using mine the most. If you like to change music often on the removable card for the flash player, and don’t wish to take all day doing it, this is a breeze. No longer do I have to listen to “The Best of Bob Dylan” for 3 weeks! It’s ok to admit it. I did this before I found my first USB thumb drive on sale. 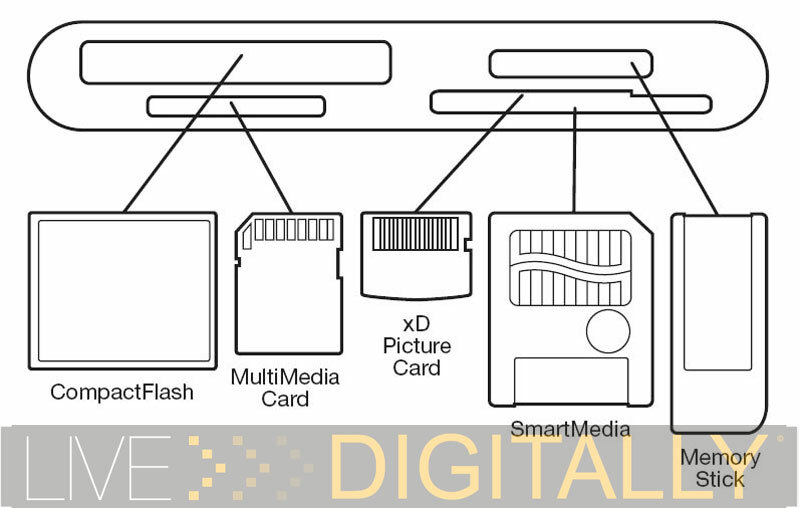 Recycle the old memory card from the digital camera to shuttle data. And access it quickly with the reader/writer. Hey, we all have to do something to keep filling our tanks with $2.50 per gallon gas! An added bonus is that the cards are smaller than many of the USB thumb drives out today. 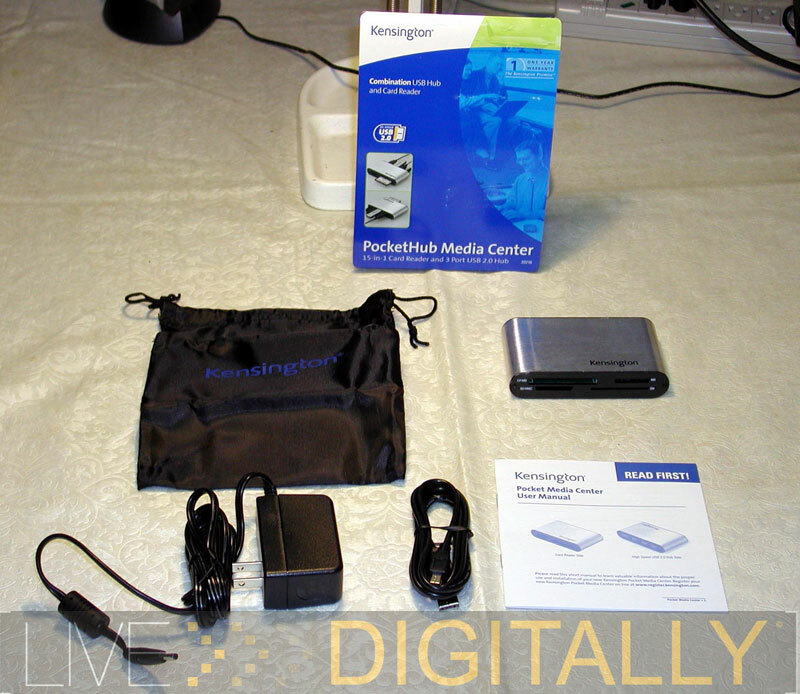 The Belkin 15-in-1 Media Reader & Writer, as well as the Kensington Pocket Media Center are most definitely LD Approved. I congratulate both companies for a job well done as well as their innovation in this product category. Special thanks to Belkin and Kensington for supporting this review. because of the margins of the page pictures are too small and the whole page is somewhat hard to read and be content. If you click on the pictures, they will enlarge.